Hello, June! Wowswers- this year is flying by. A new month means a new free printable meal planner. This one is themed for summer! If you are struggling with getting dinner on the table, posting your meal plan in a printed version on your refrigerator is a great place to start. You family will help hold you to it. You will soon be accountable! Print it out and start planning your meals one week at a time. Baby steps! Another thing you can do is laminate this printable and then use a dry erase marker so you can reuse the same printable over and over for the entire month! 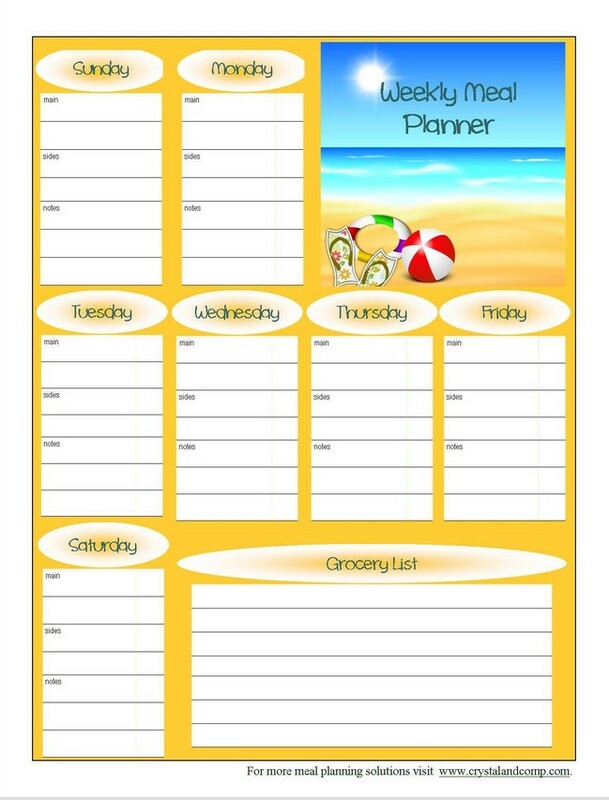 You can print out this months free printable meal planner here. Looking for a different design? Check out all of my free printable meal planners with seasonal designs and themes. Super fun! For more dinner ideas, check out all of my weekly meal plan ideas that I’ve shared here over the years. When I click on both links, it brings up a different design! I love your new planner, but when I click on the link, it is still the May planner. Any way you can email this to me? Love your blog…keep your ideas coming! Sorry about that Adrienne. I have fixed it.